The most interesting places that I have shown art in over the years have been alternative spaces – bookstores, restaurants, old factories, warehouses. I love the look of the more traditional art space – the white, the hush, the expectancy of the venue. There is almost a religious feeling. This feeling of tradition bound, reverent space is most easily seen in the main floor of the new Modern Wing at the Art Institute of Chicago. The white, open, cathedral hush is not marred by sound, as the many visitors voices are muffled by the hugeness of the space. Not only is there no sound, there is no art. You have to go out of the main vast hallway to see the art and when I am there I long to see an organic textile piece, a mobile hanging from the immensely tall ceiling, anything - anything but the hushed austerity - no matter how breathtakingly beautiful it is. Don’t get me wrong I love the space, I want to breathe it in with deep gulps but I don’t want to eat it, if you know what I mean. I love it but the space is not intimate, does not evoke familiarity, does not invite involvement. Often the more traditional art gallery makes me feel the same way. I’m happy to be there, I love the space, but the sometimes only tiniest sense of aloofness keeps me feeling a bit distant from the art. One of the Chicago galleries that I have shown at, Women Made Gallery, is an extraordinary place and does invite the viewer to feel more intimacy with the art, but there is still the slightest touch of a feeling that one should mind their manners and not put one’s elbows on the table, or make loud noises. Despite its intimate space it still has the sense of aloofness traditional galleries and art venues always have. Not so with the non-traditional art space. One of the spaces I have shown at that fits this category is the Caffé Luna in Crystal Lake, IL. Here the clank of cups and spoons, the smell of chai and toasted bagels invites the viewer to sit and relax, and really enjoy the art. I go often to see what is new on the walls; I sit with a warm chai latte, usually with a friend, and really absorb the art in a more natural, comfortable way. Another great space I have shown at on the edges of Chicagoland is the Starline gallery in Harvard, IL. It was a factory and has been converted to galleries and studios. Although it has the open, cathedral space of an art museum, this is mitigated by the warmth and earthiness of the brick, and the heaviness of the beams that were used to hold large pieces of equipment at one time. I also have shown at the Rizzoli International bookstore that used to be in Water Tower Place, Again despite the bookstore being a quieter space, than say a café, there was still a sense of comfortableness and coziness, an intimacy with the art that is lacking in more traditional spaces. It takes some courage to show are in non-traditional space. Though. I never worried, I was very aware that the paint soaked brushes of various art students were inches away from my art at the Triangle Art gallery in the Old Town Art Center. Art work can get bumped, touched, and even damaged in non- traditional spaces, a risk many artists are not willing to take and understandably so. The sense of aloofness at a traditional art space is saying, in part: don’t touch, take care, this art is special, one of a kind, it is to be admired but from a distance only. I respect that and I agree with that and I also truly do love the austerity, the aloofness of that attitude. But at the same time I love the - oh go ahead and get too close and even with sticky fingers - attitude that non- traditional art venues seem to evoke. 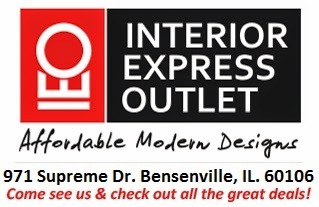 The space that my art is hanging in now at Interior Express, this amazing furniture warehouse near Chicago O’Hare, has the huge space of an art museum but only the elbows on the table feel of the non-traditional art space. Despite the vastness of the warehouse, the comfortable look of heavy equipment at rest, the feel that large things are just about to moved, the stacks of items about to be shipped or that have just arrived from parts unknown, the friendly expanse of lined up furniture waiting to make someone’s home more homey, invite those that stop to look at the art to get a bit too close if need be. So come by – take a look – even too close of a look - there is some great art on the wall and some really cool furniture. Sarah Hahne is a local artist, an independant contributor to our Chicago art and Chicago gallery dicussions. Above illustration pictures are Sarah Hahne's original art work.